A clay jug originating in France more than 250 years ago poured inspiration into the mind of Nova Scotia's renowned children's author, Jan Coates, and filled her with a passion to create a fictional account of her family's historical connection to Lunenburg. Now, after five years in the making, her novel Talking to the Moon, which is set in Lunenburg, is about to be launched at the historical Lunenburg Academy. More than just a "mystery" the main protagonist 11-year-old Katie works to solve, the novel is "a Lunenburg story about finding your roots," Coates told LighthouseNOW. Beyond that, she says, the book, which is published by Red Deer Press, is a chronicle of "those who came before us and worked hard to create the Canada we know and love." Coates is a direct descendant of David Langille, one of the 1,453 original Lunenburg Foreign Protestant settlers, and traces her ancestors back to Montbéliard, France. She suggests the Foreign Protestant history is important for young readers. "Their descendants, numbering in the hundreds of thousands, are scattered throughout North America. This is, in part, a refugee story; kids whose families have lived in Canada for many decades, even centuries, probably don't often think about their uprooted ancestors who made the perilous journey across the ocean, similar to those new Canadians arriving today," Coates noted in a prepared statement. "I suppose most of us are immigrants, our roots transplanted in that way, but few of us know our ancestors' stories," she says. 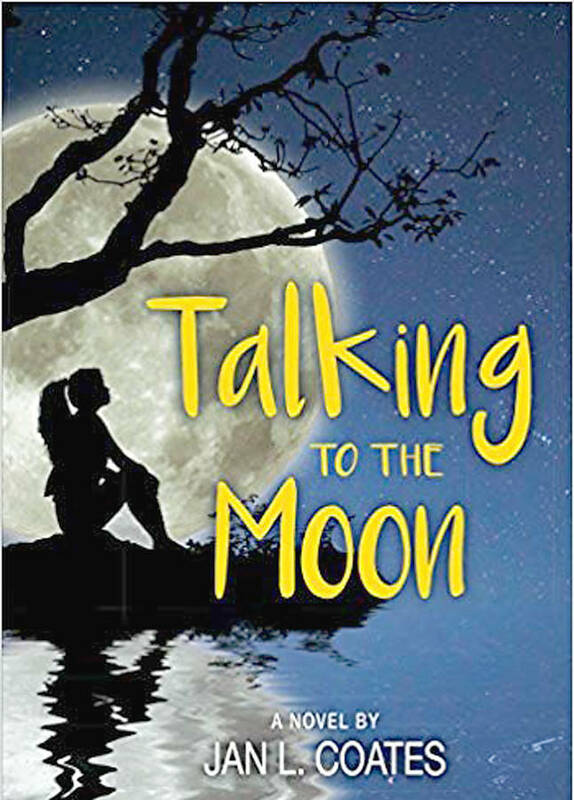 Nonetheless, while Talking to the Moon would be considered a novel aimed at the middle-grades because of its historical roots, "I think adults would enjoy reading it too. I'm hoping," says Coates. Beyond the story appearing on the pages of the book is the one that brings the tale together. Coates recalls how in the 1990s her grandfather and father went to a farm auction to buy a clay jug they knew had been brought to Nova Scotia in the 1700s by their Mingo and Menegaux ancestors, who were among the original Foreign Protestant families to settle in Nova Scotia. "I now own that jug, and I've always been curious about its story," Coates says. "My whole life, I've felt lucky to know the names of my ancestors dating back to that time, but I didn't know any details of their leaving Montbéliard (near the French/Swiss border) and crossing the ocean to settle here. I began researching and soon discovered I also had Langille Lunenburg roots. "I was hooked and knew I had to give the jug its story. I set out to write a work of historical fiction," Coates explains in the statement. The author, whose home is in Wolfville, lived in Lunenburg for a couple of months in 2013 while she did her research. And then Katie wandered into the story. According to Coates, she had been working as a substitute teacher, which involved assisting children on the autism spectrum. "And this girl sort of came into this story, very strangely. And it became her story," Coates said. In the story, Katie is a foster child who arrives in Lunenburg in 2015 for the summer looking for her birth mother and finds deep roots in Lunenburg. In part it's through a series of letters she discovers from her ancestor, Catherine Langille, dating back to France in 1752. Coates says she realized the protagonist she was writing about was also on the autism spectrum. "Not on purpose, but just she has little traits and things." She agrees it was like the character took on a life of her own. "Until you write a novel, you don't realize that actually happens... And that's when you begin to feel good about it. You're telling this person's story, essentially. It's very weird." Today's Lunenburgers will recognize the modern backdrop to the novel, including references to the Lunenburg Foundry and the Salt Shaker restaurant. "Because this became Katie's story, I wanted to include the description of this new-to-her town as she would have experienced it for the first time, giving colour names to the painted houses, noticing the plaques indicating the original owners of the buildings, all things she does to help herself become comfortable in yet another strange place," writes Coates. In homage to the history of the town, the book launch will be held at the new library in the newly restored Lunenburg Academy building Aug. 16 at 6:30 p.m.
Children's songwriter Tom Chapin has agreed to sing his song Family Trees, from which Coates borrowed a line for her story. The younger brother of the late Harry Chapin, Tom, who lives in New York, will be in the area for his family's annual concert at their property The Ovens.